Thrasher's Blog: My Morning Jacket's Upcoming Album "Z"
"To try to lump the band into one musical genre doesn't seem fair, as rock-country or alt-country or anything else would never cover all the bases. And with a band that seems perfectly able to channel Neil Young as much as Wayne Coyne, it is difficult to anticipate what's to except from this album, particularly as it features two new members (Bo Koster on keyboards and Carl Broemel on guitar)." "This one is totally different from everything else. It's the first album with two new members from the band...two new people and that's definitely going to change the sound a bit. They've opened up some new areas. It's a result of all of us growing up quite a bit. It's kind of a reflection of our attitudes on the state of the world. We could choose the low roads and be depressed; but we're choosing to be really positive. It's more spacious, as we took a kind of 'less is more' approach. More danceable, so to speak, but there are definitely rocking moments. We like music that moves you. That's definitely in there as well. This album is all over the place really." 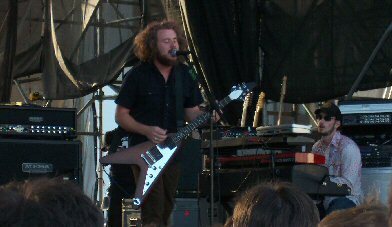 More on My Morning Jacket. Kathleen Edwards: An Unknown Legend? Willie Nelson Goes Reggae on "Countryman"